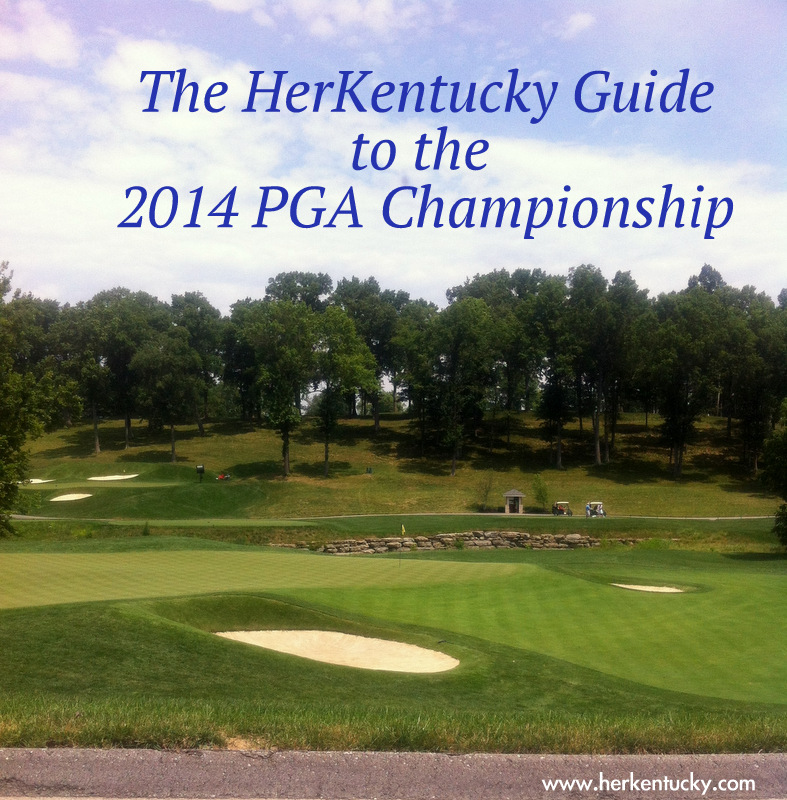 If you've been within a hundred mile radius of Louisville this week, then you've heard something about the PGA Championship! Wednesday, we brought you the HerKentucky Guide to Picking the Perfect Outfit. Today, we have a few tips on what to expect. Parking for the PGA Championship is a bit tricky. If you drive a Mercedes, you can park in a special lot provided by corporate sponsor Mercedes-Benz. If you aren't buying a new Benz for the event (trust me, I threw the idea out at my house, but it didn't fly...), then there are several options. You can park at Cardinal Stadium or Churchill Downs to catch a shuttle, or you can park at one of the designated lots (passes must be pre-purchased; they are not available the day of the event!) near the course. Bob and I parked in Lot B, which was, for all intents and purposes, a field in the Distillery Bend area of the Parklands of Floyds Fork. 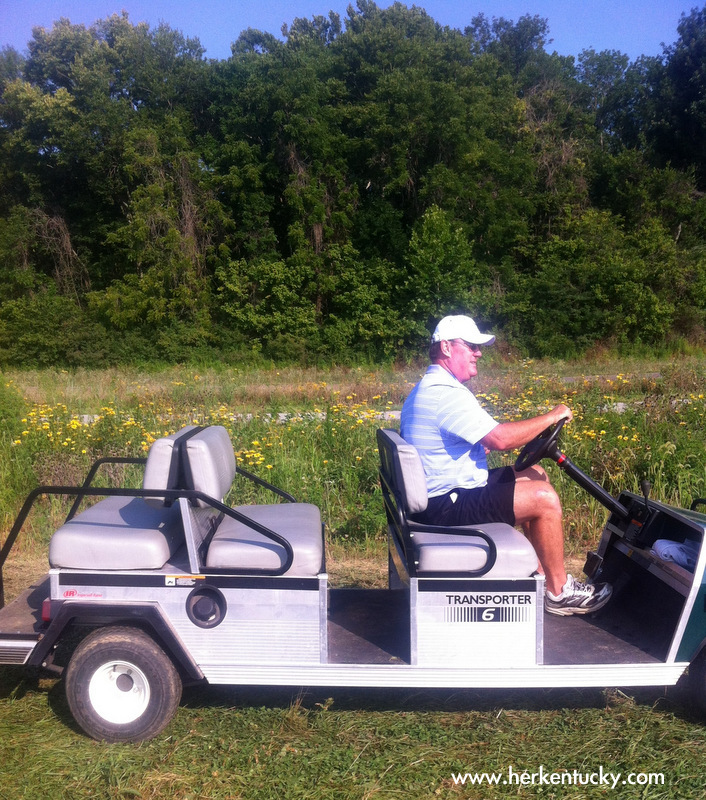 There were carts to take us to our shuttle bus. When you arrive at Valhalla, it is decked out like a fabulous, golf-themed Disney World! 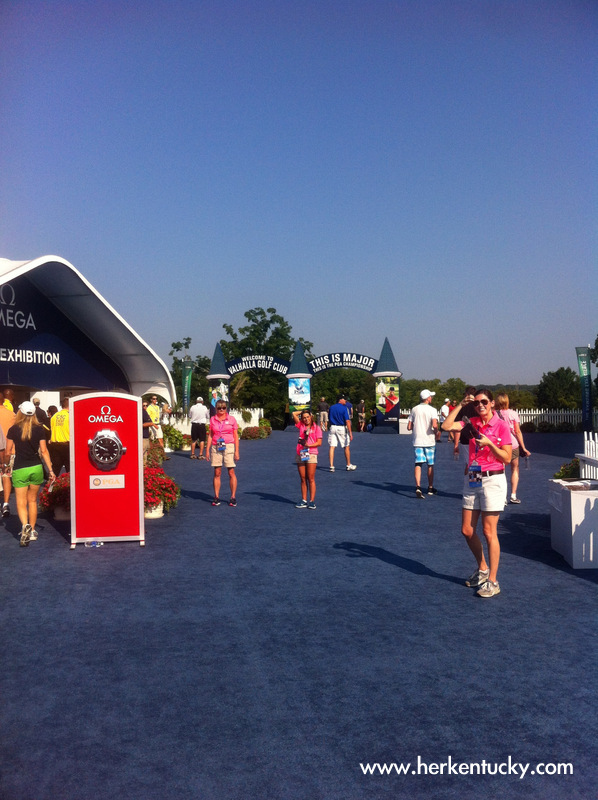 There are exhibition tents, just in case you need to buy an Omega watch or Samsung phone to get the day started. Some of Kentucky's larger employers, including Brown-Forman, Lexmark, and the state government, have reserved clubhouses. Wanamaker Club ticketholders are also able to enjoy the comforts of seating and air conditioning! The course itself is stunning! I took a moment to enjoy this stream between Holes 2 and 3. If you aren't a golf fan, it's pretty easy to catch on to what's happening. Leaderboards and tee positions are well-marked. And, trust me, there are plenty of fellow spectators who'll want to bloviate about the event! Most of all, enjoy your day at the course! It's a great showcase for Louisville, and a fun time!